In my case this was caused by lack of DNS entries. Just creating a sip CNAME to my OCS 2007 server was enough, but there are others you can create. I found a tool that helps you troubleshoot DNS issues here. 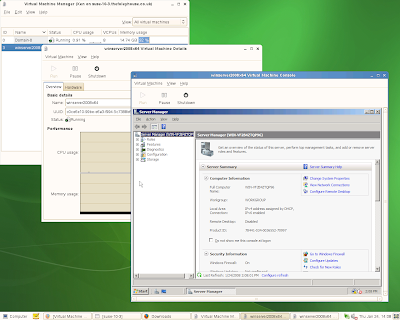 Failure to activate OCS 2007 during installation. This can be based by having a space ( ) or quote (") character in the service account passwords. Looks like the setup program does not quote the password correctly, so fails when either of these two charaters are used. After the install of Silverlight - My D-Link DCS-6620G camera started returning HTTP 400 Bad Request errors. Locating the key, HKEY_LOCAL_MACHINE\SOFTWARE\Microsoft\Windows\CurrentVersion\Internet Settings\Accepted Documents, I removed a couple of XML document type I figured that I would never use. I've recently had an issue with my main desktop machine losing network connectivity overnight. No other machines are affected, only my desktop one. The problem computer is connected via wired ethernet to a Netgear GS105 Gigabit switch. The lights on the switch stay on, so there appears to be nothing wrong with the physical connection but the system still can contact nothing on the network. What has worked as a fix, was to go into the network connections, disable and then enable the LAN connection. The computer will then work fine for another 24 hours. Now, each time the connection has stopped working, I have had my Windows Mobile 6.0 phone plugged in, synchronising and charging. I wondered if this was the same as Internet Connection Sharing as the phone is given an IP and can access the network via my desktop computer. When I had network problems with my network camera, I do remember switching on RSS (receive side scaling) as part of the changes made to the IP stack. I'll followup with any further lockups or not! I've been having an issue for some time where certain users and groups were having thier AD inheritance flag cleared and an arbitary set of permissions made. It turns out that this is by design. Because the users belonged to a group, which belonged to Print Operators, thier permissions were being set to match the System\AdminSDHolder object. The PDC emulator runs an hourly process which copies the permissions from AdminSDHolder to these protected objects. The following article describes how to remove Print Operators from this protected list of groups. The article talks about a hotfix, but this is only relevent for Windows 2003 SP1. Windows 2003 SP2 already has this change. Faulting application DPMRA.exe, version 2.0.5820.0, time stamp 0x46f990f7, faulting module kernel32.dll, version 6.0.6001.18000, time stamp 0x4791ada5, exception code 0x80070002, fault offset 0x000000000002649d, process id 0x1ff8, application start time 0x01c8cebaac1ac7c8. Essentialy you use 'netstat -oan' to find the PID of the process using port 5718 or 5719, which are both required by DPMRA. Then use 'tasklist' and 'tasklist /svc' to discover which process it is. In my case, it was the MS Exchange Information Store. I fixed it by stopping all Exchange services, starting DPMRA and then restarting Exchange. It's kind of weird that MS Exchange can use the DPMRA ports when DPM is speciffically for protecting Exchange (amongst other things). I've found this quite useful in debugging slow logins or incorrect application of group policy. Having fixed my SQL 2005 issues with DPM 2007, I found my main production SQL database was missing from the list of resources available to be protected. When attempting a normal SQL backup, I got an error message telling me that the Full Text Index was missing. I recreated the Full Text Index, (got lost when changing SQL versions - No backup, that's what DPM was supposed to do! ), and everything worked great. The thing I learned here was, if DPM is having problems protecting a resource, try another backup type for more information on the error! DPM would not protect the SQL databases, and kept giving errors that the protection was "inconsistant". There were lots of SQLVDI errors in event viewer, including a BADMEM error. To cut a long story short, I found the fix was to replace the x86 version of SQL 2005 with an x64 version. I added it just before the tag. We are now running on Server 2008. Let me know of any issues please! There are a number of reports avaiable in Exchange Management Shell. Add-AdPermission "Distribution Group Name" -user "Mailbox Name" -AccessRights extendedright -ExtendedRights "send as"
After all the hassle of getting Exchange 2007 setup yesterday, I found that I had no way to backup my Exchange 2007 server running on Server 2008. For whatever reason, Microsoft do not supply NTBackup and there is no in-built way of backing up Exchange 2007 when run on Server 2008. Now, I could opt for a third party backup program or use Microsoft DPM, but for my 4 user network, this is a little bit of an overkill. When NTBackup starts, you will see an error regarding removable storage, but I just ignored this and clicked "Do not show this again"
Upon running NTBackup, I could see drives and system state, but no Exchange! I ran regedit and changed the esebcli2 key from C:\Program Files\Micrsoft\Exchange Server\Bin\esebcli2.dll to C:\Program Files\NTBackup\esebcli2.dll. I ran NTBackup and backed up my Exchange store to disk! I've learnt a hard lesson today. 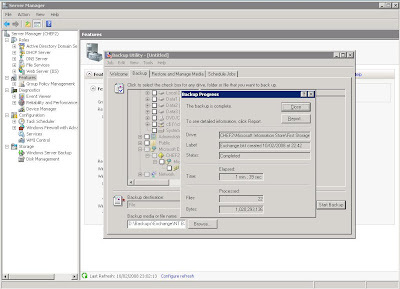 Never unbind IPv6 from Server 2008 if its running Exchange 2007. I had some problems adding some Vista laptops to a Server 2008 domain today. I couldn't determine if it was SP1 RC1, UAC being turned off or IPv6. The computers would not join the domain using the GUI. I had to manually extract the XP SP2 version of netdom and use that, after manually creating the computer accounts in the domain. All was well until I restarted the Server. The Exchange Transport Service hung in "starting" and I could not connect to the Exchange server using the Power Shell or Console. I kept getting AD errors from these tools, and lots of errors about the Exchange AD Topology service not being able to contact AD. To cut a long story short, I flattened the server and started again - Only to discover that IPv6 wasn't the problems with the workstations joining the domain, but it was the problem for Exchange 2007! I never did get to the bottom of the problem joining the domain though. At least I have a work round now - Use XP SP2 Netdom! I'm upgrading my Exchange 2003 organisation to Exchange 2007 this weekend, as a reinforced learning experience for when I begin to deploy Exchange 2007 for a major customer. A setup error occured: "[ERROR] Access to the path 'D:\Setup\ServerRoles\Common\64' is denied"
When I re-ran setup, it installed, but there were no routing group connectors between the old routing group "First Administrative Group\First Routing Group" and the new routing group "Exchange Administrative Group (FYDIBOHF23SPDLT)\Exchange Routing Group (DWBGZMFD01QNBJR)". I created the routing group connectors, and moved a mailbox, but mail would not flow. Kept getting 5.7.1 Relay Denied errors from the new organisation. For some reason, my new Action Pack came with Exchange 2007 SP0 and not SP1. I've downloaded Exchange 2007 SP1 and will reinstall this when I have removed Exchange 2007 from the server. NB:Just what does FYDIBOHF23SPDLT and DWBGZMFD01QNBJR mean?They are shifts of "EXCHANGE12ROCKS". First one, add 1 to each character, second one, deduct 1 from each character. 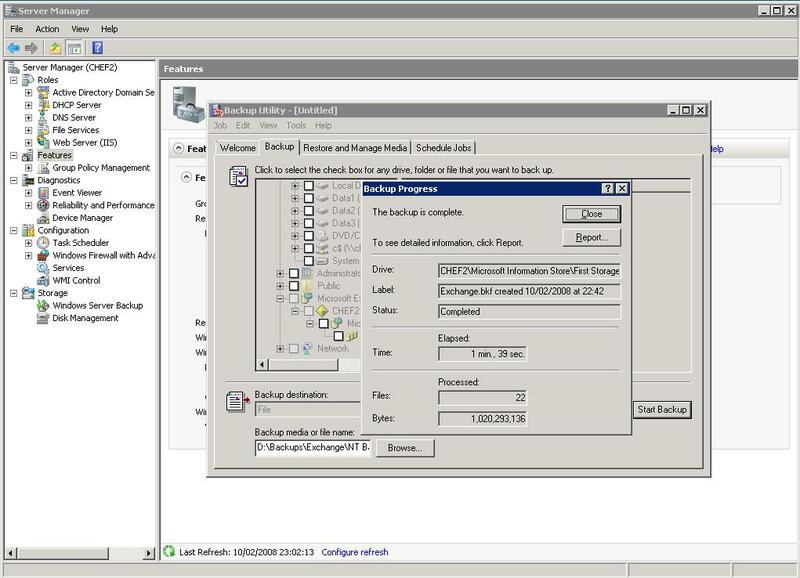 With the latest RC1 refresh, you have to install Server 2008 with the default language settings in order for the vmss service to start properly. We need a way of creating users Outlook profiles automatically. They can run this the first time they login, or at any other time to recreate thier profile. First download the files here. The files are stored in a shared directory. We created a directory in SYSVOL so that all users could access them. The path would be something like \\YourDomainName\SYSVOL\YourDomainName\Scripts\OutlookFirstRun. They could be stored in a standard shared folder if you prefer, just edit the path in the scripts. This is an AutoIT script that you need to edit and compile to an .EXE using Auto IT (Freeware). The outlook icon for compiling OutlookFirstRun.exe. We used this so that the program looked the same as Outlook. This is a VB script that writes the users display name to a file. We write it to F:\Display.txt, as F:\ is the users home directory. Again, you can change this. This is a file that contains settings to be imported into outlook. It sets up the users profile for them. Instead of launching Outlook.exe, the user launches OutlookFirstRun.exe. You have to arrange for this to happen. We use Ericom to publish this as a terminal server application but you could create an MSI or use the RunOnce registry key. The program could be included in your build Ghost image for example. DisplayName.vbs reads the users display name from AD and creates as an Environment Variable %DISPLAYNAME%. OutlookFirstRun then launches Outlook.exe and imports Outlook.prf. Outlook.prf must be edited to contain your Exchange server name and any additional changes. We don’t use cached PSTs for example, as we’re running in a terminal server farm environment. Feel free to use these files - Distributed under GPL-v3. On several AD installations with multiple domain controllers I have seen servers continuosly logging event 1058 and 1030. Running "dfsutil /PurgeMupCache" followed by "gpupdate /Force" always seems to fix it.